Calculations at a barrel. Geometrically, a barrel is a truncated prolate spheroid, with circles of equal size on top and on bottom. 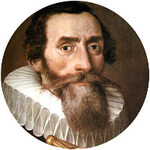 The formula for the barrel volume was discovered by Johannes Kepler. 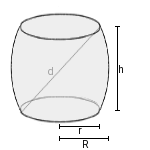 The surface area of a slightly bent barrel is close to that of a cylinder with the radius R. Enter both radiuses and the height and choose the number of decimal places. Then click Calculate. Radiuses, height and diagonal have the same unit (e.g. meter), the volume has this unit to the power of three (e.g. cubic meter).